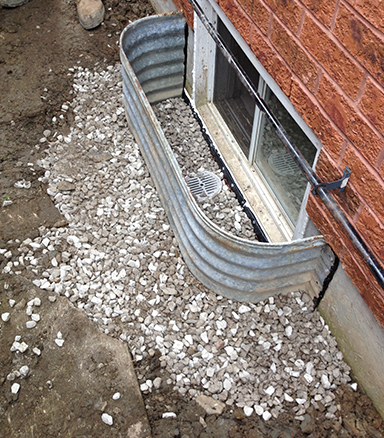 Window wells are common when a property has a basement, as they give light to the space but can also be an escape route for an apartment. A lot of the time, the window wells are connected to the weeping tile system, but when the system is blocked they can allow water build up in the wells. In many homes, the window wells are not connected to weepers and water is allowed to build up in the window area, which can compromise the window. Another way water gets in is through any cracks that are present in the foundation where the window has been cut out. This can allow the concrete to crack and let water penetrate the foundation wall. The technicians at PH Group are trained to recognize the different tell-tale signs, have the right solution to deal with the situation, and will provide the answers you are looking for. Q. Do you have to dig up the window well? A. This all depends on what we find. It may just be leaking from a foundation crack, and the repair can be carried out from the inside, which would mean no outside digging. Q. Why is the water not draining around my property? A. There are a number of factors to take into account, for example the water table, the soil (sand, clay), and the grade of the property. Any of these could be contributing to poor water drainage. At the PH Group we have the answers to your problems. Q. We only have septic tanks where will the water go? A. In many cases, an engineered well (dry well) can be installed to deal with the excess water. These are filled with stone and in many cases have to be passed by an engineer and the city.